I’d like to see you jump right out of bed after sleeping for six months! 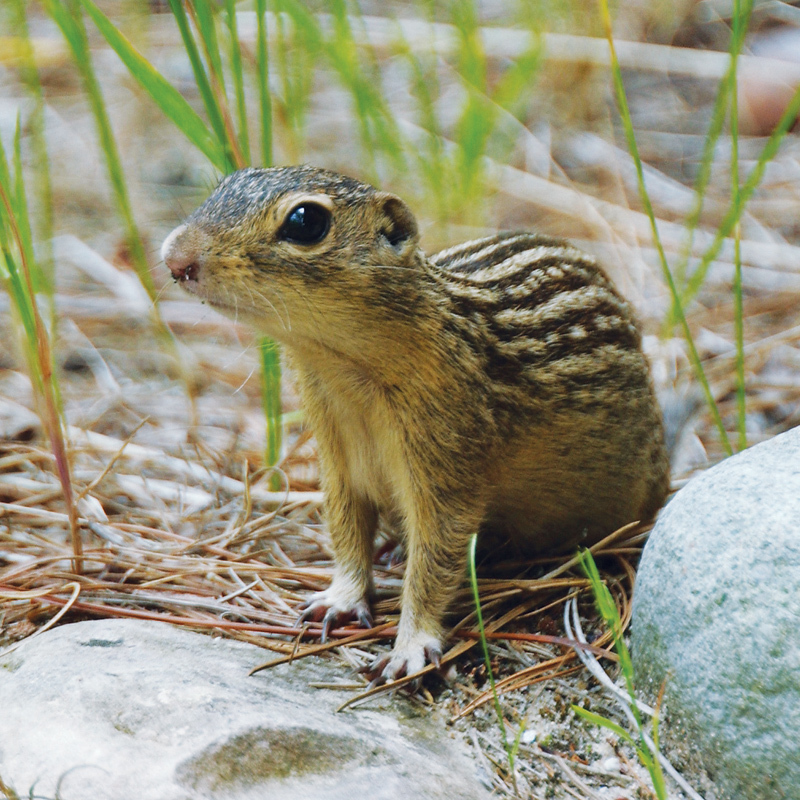 We thirteen-lined ground squirrels (Spermophilus tridecemlineatus) hibernate from late September/October to April/early May. Our heart rate decreases from 200-350 beats per minutes to only 5-20 beats per minute; while our breathing goes from 100-200 breaths per minute to once every five minutes. Our body temperature drops to just above freezing. We hibernate curled up in a tight ball, in our sealed underground den, and lose about a third of our body weight over winter. We measure about eleven inches from nose tip to the end of our black-striped, skinny, slightly bushy, four-inch tails. Check out our tiny ears. Thirteen strips of alternating dark and light stripes go along our backs with the darker, wider, stripes highlighted with light spots in their centers. The rest of our bodies appear tan with overtones of yellow or orange. We run with our tails held straight out behind us; not up in the air. We weigh about the same as a chocolate bar; our females weigh a bit more. We love warm, sunny days for scampering through wide-open areas with short grass and well-drained sandy or loamy soils (good for digging). This includes prairies, fields, golf courses, road sides, cemeteries, pastures, and parks. You won’t catch us scurrying about in the dark or on most cloudy days. We use our excellent vision while standing on our hind legs to search for danger. If we spy a predator like a hawk, snake, owl, fox, coyote, or weasel, we whistle a high pitched “churrrr” to warn our neighbors and family. We also possess outstanding senses of smell and touch. We often rub glands located around our mouths on objects to mark our territory. We great each other by touching noses and lips; something like kissing. We are champion burrow diggers, which is a good thing, since we spend half of our lives in our burrows. We dig short burrows for dodging into when danger threatens. Our main borrow starts with a two-inch hole hidden by plants. Just beyond the opening, we construct an “L” to trick burrowing predators, like badgers, into thinking the tunnel ends. We dig most of our 15-20-foot long tunnels in the top two feet of the soil with several side passages and special lower chambers for hibernating and raising our young. For half of our diet, we eat all kinds of seeds and green plants like grass and clover. For the other half, we consume a variety of insects and other animals including grasshoppers (yum! ), caterpillars, beetles, ants, mice, earthworms, small birds, and sometimes each other. We store nuts, seeds, and dried plants for those cloudy days and for late fall and early spring. We carry the food we store to our dens inside our cheek pouches. We rarely drink water and, instead, rely on the water in the food we eat. Next time you find yourself in a short-grass opening, see if you can find us before we spy you and dodge into a nearby burrow!